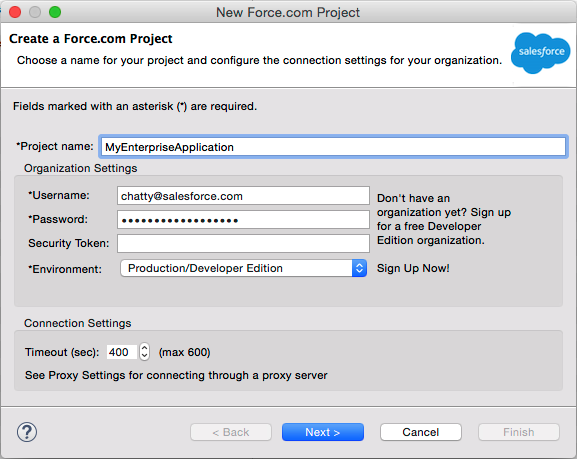 The Force.com IDE is a powerful client application for creating, modifying, and deploying Salesforce applications. Based on the Eclipse platform and built on the Tooling API, the Force.com IDE provides a comfortable environment for programmers familiar with integrated development environments, letting you code, compile, test, package, and deploy all from within the IDE. Much of the actual work, such as compilation, happens in the App Cloud—the Force.com IDE performs the communication and result parsing transparently. To sign up for a free Force.com developer account, visit the Salesforce Developers community. By adding the following code below to your website you will be able to add an install button for Force.com IDE. Could not open "New Force.com Project" window. I have installed Eclipse 2018-12 (V 4.10) with no problems. After that installed Force.com plugin with no problems. After that, when I try to create a new Force.com Project, the corresponding window does not open.